Welcome to the Center for Geospatial Analytics Internal Resources site. Here you will find information about center policies, important contact information, forms for making requests, style guidance, and useful links. Below, you will find information relevant to anyone affiliated with CGA. How do I gain admin control of my lab PC? Email Zac Arcaro (zearcaro@ncsu.edu) with a request. Include your unity ID and the computer name (ie GIS-Lab-01). How do I install software on my lab PC? If the software is open-source or freely available, you may install it yourself. If the software is proprietary, check software.ncsu.edu to see if the university has a licence. Install it yourself or send CNR_help@ncsu.edu a request for assistance. How do I connect my PC to a printer? Open Windows Explorer and enter \waterworks into the navigation bar to see a list of printers by building and room number. Double-click to install the printer. The printer in my lab/office is out out toner. What should I do? Remove the cartridge and shake to extend printing life. Email Mary Hicks (mhhicks@ncsu.edu) and copy Zac Arcaro (zearcaro@ncsu.edu) with a request for new toner. The printer is in my lab office is out of paper. Where do I find more? Paper is available in room Jordan 5104. I am having other problems with my printer. Who should I contact for help? Send a description of the issue to CNR_help@ncsu.edu and copy zearcaro@ncsu.edu. How do I access my Lab PC remotely? How do I map CGA/CNR network drives? How do I print to the CGA plotter? There is a poster printer in the Geovisualization Lab closet. To print, email a PDF of your poster to CNR_help@ncsu.edu and request it be printed on the CGA plotter. You are strongly advised to request printing in advance to give the IT team time to prepare your poster and in case there are any unforeseen issues with the plotter. Contact Rachel Kasten (rachelkasten@ncsu.edu) for additions or inquiries. Please respect our inboxes and limit mass messages to those that are absolutely necessary. Forward all external notices/job postings to Eric Money (esmoney@ncsu.edu) for review and posting. The CGA hosts a number of Google Calendars that will keep you up to date with ongoing events, courses, and meetings. We suggest making all of the following calendars visible on your own Google Calendar. Includes all events of general interest to CGA faculty, staff and students (Geospatial Forum, Geospatial Studio, orientations, etc). Maintained by CGA Administration Office; contact Mary Hicks (mhhicks@ncsu.edu) to add/edit events. To add this calendar to your list of “Other Calendars” on your calendar page, follow this link and click the “+GoogleCalendar” button in the bottom right corner. Includes travel plans of general interest to to CGA faculty, staff and students. The intent is to facilitate collaborative planning and/or help avoid conflicts. If you or your students are traveling to conferences or meetings, event details and dates of travel can be posted here. Frequent travelers may request direct access to post. Includes core classes, deadlines, and other events of interest to our Geospatial Analytics Ph.D. students. Maintained by CGA Administration Office; contact Rachel Kasten (rachelkasten@ncsu.edu) with questions. To add this calendar to your list of “Other Calendars” on your Google calendar page, follow this link. This is a public calendar. Contact John Vogler (jbvogler@ncsu.edu) or Megan Skrip (mmskrip@ncsu.edu) for inquiries. To request a reservation, contact Mary Hicks (mhhicks@ncsu.edu). While in most cases you will not be able to add events to the room calendars, adding (and using) the room calendars will allow you to confirm that the room has not already been booked before requesting a reservation. The CGA strives to maintain a standard design style that expresses our unified mission and visual identity. We therefore request that all CGA-affiliated faculty, researchers, staff, and graduate students adopt a standardized email signature. Templates that you may copy and paste into your own email settings are available. The Center for Geospatial Analytics is an example of an NC State core brand extension. Core brand extensions are very closely held entities; they reflect the core brand market position and need to use the same messaging platform and visual identity as the overall institution. Visit the visual identity page to learn more about CGA’s brand identity, download logos, and access the approved color palette. Jordan Hall and some CGA labs have electronic card readers that grant access using your campus ID card. Complete the Electronic Access Request Form if you would like to request access. Get some good news lately? Don’t keep it to yourself! We want to know too! Please fill out this form each time you win an award, receive a grant, or publish a paper; are interviewed by the press, invited to speak somewhere, accepted to present at a conference; or have anything else you’d like to share. The info will help our Graduate Services Coordinator, Rachel Kasten (rachelkasten@ncsu.edu), and our Science Communicator, Megan Skrip (mmskrip@ncsu.edu), spread the word about just how great you and your work are! Your accomplishments will be included in the center’s annual report to the Dean and celebrated on the center’s bulletin board, news blog, and/or social media channels. There is a lockable room available for anyone who needs to pump or breastfeed. The lactation room includes a private refrigerator, a glider, and storage for breast pumps and other items. Please see Zac Arcaro for keys or Rachel Kasten with suggestions to improve the space. Below, we provide resources specifically suited to CGA-affiliated faculty and staff. Parking passes allow people visiting the CGA to park in the spaces around Jordan Hall, and are requested from NCSU Transportation through the CGA Administration Office. To request that the Admin Office secure a pass on behalf of a visitor, submit the Visitor Parking Pass Request Form. Passes will be requested and authorized via the email address you provide on the form. 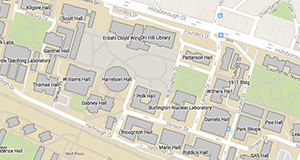 CGA policy for allocating lab space applies to all seats in rooms 5117, 4120, and 4117 in Jordan Hall as well as the graduate student desks in the Geovisualization Lab. Spaces are allocated at the discretion of the CGA director and steering committee. Seating will be allocated on a yearly basis (1 July – 30 June). Faculty may request seats for their students at any time using the Lab Space Request Form. We are currently able to accommodate the vast majority of requests for space. However, as the CGA grows and the Ph.D. program becomes established, the demand for lab space will soon be greater than availability. Priority will be given to requests made by CGA faculty fellows on behalf of individuals whose geospatial activities most closely align with the strategic plan and mission of the center. In an effort to make visits to the Geovisualization Lab more efficient, strategic, and beneficial to all parties involved, the Center for Geospatial Analytics has developed a new policy regarding appointments and demonstrations in the Geovisualization Lab. CGA will no longer offer tours that do not have a clear strategic purpose with actionable outcomes. Rather, goal-driven GeoVis Discovery Meetings will be hosted by CGA Faculty Fellows and Researchers who seek to develop external collaborations and partnerships, to fulfill contractual obligations with funders and community partners, or to cultivate funding opportunities. We will encourage members of the community interested in visiting the Geovisualization Lab to either attend an Open House (to be posted on the CGA events calendar) or contact Faculty Fellows and Researchers who best represent their shared interests and goals for a personalized appointment. Faculty Fellows and Researchers who are contacted about hosting, or themselves would like to initiate, a GeoVis Discovery Meeting will fill out a Discovery Meeting request form. Requests made through the form are approved by the CGA Director and forwarded to the CGA Admin Office to arrange through the room 5111 Google Calendar. The Admin Office will also generate and distribute parking passes, if necessary. Faculty Fellows and Researchers will be responsible for hosting and moving their group through requested demonstrations. Discovery Meetings must include at least 15 minutes of concluding discussion to solidify action items and future collaborative steps. The request form includes a field for reserving the conference room (5119) for this purpose. If you are contacted about an educational partnership, please refer the query to the CGA Associate Director of Professional Education. CGA will no longer accommodate visit requests from school groups that have not first connected with the Associate Director of Professional Education about a strategic initiative. Below, we provide resources specifically suited to CGA-affiliated graduate students. Geospatial Analytics doctoral students in good standing may submit an application for the Geospatial Analytics Travel Award for up to $800 twice per year. There is no limit to the number of times a student may apply for or receive the award. The application deadlines are July 15 for travel September-February and January 15 for travel March-August. Applications will be accepted for conference opportunities that fall outside of these deadlines on a case-by-case basis. For more information, contact Rachel Kasten (rachelkasten@ncsu.edu). The body of the post should tell a brief, interesting and informative story about the work supported by the travel award––e.g., the research presented at a conference (and why it matters), a unique experience at the conference (for example, a workshop attended or led), or how data collected while traveling will be used. Students are encouraged to write in first person, with active voice, and be creative. The audience for the center’s news blog includes people outside of the field of GIS and even outside of the sciences; students should introduce their main message in the first paragraph, avoid jargon and keep explanations simple. The Science Communicator will review all submissions for clarity before posting. The National Association of Black Geoscientists provides scholarships to undergraduate and graduate minority students undertaking full-time study in a geoscience program. The DOE Computational Science Graduate Fellowship provides outstanding benefits and opportunities to students pursuing doctoral degrees in fields that use high-performance computing to solve complex science and engineering problems. NOAA’s Dr. Nancy Foster Scholarship Program recognizes outstanding scholarship and encourages independent graduate level research — particularly by female and minority students — in NOAA mission-related sciences of oceanography, marine biology and maritime archaeology, including all science, engineering and resource management of ocean and coastal areas. The National Defense Science and Engineering Graduate Fellowship is a highly competitive, portable fellowship that is awarded to U.S. citizens and nationals who intend to pursue a doctoral degree in one of fifteen supported disciplines. The goal is to help DoD increase the number and quality of the nation’s scientists and engineers. NDSEG Fellowships last for three years. Sigma Xi, the Scientific Research Society, funds research and mentors graduate students from the sciences and engineering, many of whom are Sigma Xi members. The American Society for Engineering Education (ASEE) offers scholarships for STEM graduate students for five years who will work with the Department of Defense. Our GIST program website maintains a Careers Dashboard with information about job and internship postings, organizations for geospatial professionals, professional certifications, and professional conferences. The ECOLOG-L listserv operated by the Ecological Society of America posts opportunities for graduate work, postdoctoral positions, jobs, and professional development. The Graduate School at NC State offers a range of signature programs to supplement your degree and sharpen your competitive edge. For more information, visit the Graduate School’s Professional Development page. Check out this June 2017 post on the Online Programs blog about career resources for GIST professionals.